Did you know that when sourcing products besides quality, price, and finding a trustworthy supplier there’s another important factor that a lot of online sellers overlook? That is product safety labeling and certification! “Another concern of mine with sourcing products is whether there are any statutory requirements by USA or Canada for specific products before they’re imported. Some manufacturers know and they’ll give me a heads up but some don’t and It’s up to me to find out if a specific product requires any special testing or certification. The worst case scenario would be as Sameer said, finding out at the last minute if you’re product is missing some sort of certification for a safety standard that you’re lacking. This could mean that your whole shipment will need to be taken off the market! And you probably will have to write it off as a loss until you get your product certifications in order. Good news, I’ve invited Fredrik Gronkvist, Co-founder of Chinaimportal.com and AsiapropertyHQ.com to explain what every Importer must know about mandatory safety standards when importing from China. He is one of the most knowledgeable people about product safety and labeling I know and he’s also a Shanghai-based entrepreneur from Sweden. All products are subject to regulations of some kind. Be it a simple label, or more complex regulations that involve lab testing, safety standards and documentation. Importing non-compliant products is illegal, and can result in heavy fines or a forced recall. Further, Amazon and other marketplaces are increasingly strict – and in some cases their own product requirements are even above what the law requires. Keep reading, and learn how to find out which regulations apply to your products, how to check if your supplier can even make compliant products – and much more. For many products, there are mandatory safety standards that sets requirements affecting the design and functionality of a certain product. For example, toys must not have loose parts, and phone chargers must be designed according safe electronic construction principles. A product must be designed with a specific standard (or set of standards) to be compliant. Most products sold for the domestic market in China are not. A product may not contain excessive amounts of lead, cadmium, phthalates and other restricted chemical and heavy metals. Some materials are made to comply, while others are non-compliant. 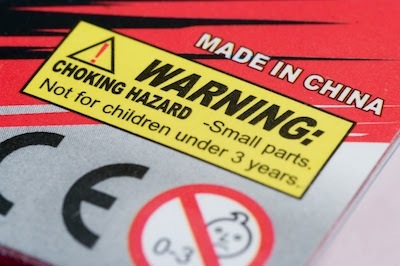 A product must carry the correct labels, which may include compliance marks (i.e., FCC or CE), material descriptions and country of origin (i.e., Made in China). The Importer may need to issue a set of documents, such as a CE Technical File or Children’s Product Certificate. Lab testing may or may not be mandatory, but it’s the only way to verify that a product is compliant with all applicable safety standards and chemical / heavy metal restrictions. Some product regulations only cover simple labels, while other are more complex and require the the Importer to cover all 5 parts. Why do I need to care about product safety? As an Importer, you are responsible for ensuring that your imported products are fully compliant. If you import a product that is non-compliant (i.e., incorrectly labeled), the customs authorities, or other market surveillance agencies such as the CPSC, can seize and destroy the cargo – or issue a forced recall. If anyone is injured by your product, you are looking at possible millions of dollars in fines, or even prison. The stakes are high, to say the least. But this is my supplier’s responsibility, right? No. Suppliers in China are not legally required to comply with overseas regulations. US laws are not applicable in China or Vietnam – and of course vice versa. As such, US regulators cannot enforce product safety standards effectively in foreign countries, which is why the burden to ensure compliance falls entirely on the Importer. This is also the case in the EU, Australia and other regions around the world. And, would it even make sense for a Chinese supplier to hire lawyers to keep track of product regulations in countries all over the planet? For the same reasons you shouldn’t expect your Chinese supplier to design your website or manage your marketing campaigns – don’t assume that they will keep track of the regulations in your country. How do I know if my product is regulated? All products are regulated, because all products must be safe for the consumer to use. This is the case even if no product specific safety standards or regulations apply. In addition, labeling requirements tend to apply broadly to all products. In the US, all products must carry a country of origin label – which is why you see ‘Made in China’ everywhere. That said, some products are more strictly regulated than others. This includes, for example, children’s products, electronics, cosmetics and food contact materials. In the US, most standards are not developed and implemented by the government, but by industry associations such as Underwriter Laboratories (UL), ASTM and ANSI. Even though many of these standards are voluntary to apply, you are strongly recommended to do so. All EU member states use the same set of harmonized product regulations. You don’t need to keep track of different regulations in each member state, which makes life a lot easier for business owners. CE Mark: Mandatory for many products, including electronics, toys, bikes and machinery. Most developed countries in the world have their own set of product regulations, that are to a varying degree based on EU and US standards. For example, the Singaporean government is even referring to EU and US standards on it’s website for product safety standards. In Australia and New Zealand, most regulations are largely based on European ISO standards. You must learn the compliance process for each country you intend to sell in. While the fundamentals (and sometimes even the standards themselves) are the same as those in the EU or US (mostly EU though) – there may be differences. So, what could possibly go wrong? Quite a lot it seems. Still remember the hoverboard craze? I used to see them in Shanghai all the time, until the government banned them. In late 2015, several reports concerning exploding Hoverboards (or their li-ion batteries, to be specific) in the US, Europe and Asia. Amazon reacted in December 2015 and suspended every single Hoverboard seller – and forced them to provide UL test reports, proving that the batteries are safe. Most sellers didn’t have those documents. Probably they assumed that ‘product safety’ is a minor issue best dealt with by the supplier. A few months ago I received an email from a client. They had recently imported a private label product from China, and had to unlock the product category on Amazon.com before they could start selling it. Before unlocking the category, Amazon did a manual review of the compliance documents. The Importer did their homework. They had already obtained a test report and a declaration of conformity from their Chinese supplier. Amazon don’t just accept any compliance document they get. In this case, the Importer submitted old test reports issued 2 years prior to their own order. And, the Declaration of Conformity wasn’t even issued in the right company name. Amazon didn’t buy it, and the listing was rejected. I never heard back from them since this summer. Assuming they did get their product lab tested (and it passing), it’s possible that they eventually succeeded. This sounds scary. Should I just get a 9 to 5 job instead? Product compliance may sound overwhelming, but luckily, you only need to get your head around the regulations that apply to your product, in your market. That said, some products are more complex than others. Personally, I would stay away from cosmetics, children’s products and electronics. But that’s just me. We also cover product compliance in our Starter Packages for Importers, that you can learn more about on www.chinaimportal.com.